Jacaranda mimosifolia usually goes by the genus name Jacaranda here. Elsewhere it may be called Green Ebony or Brazilian Rosewood. In South Africa and in parts of Australia and in Hawaii Jacaranda trees have become invasive displacing the native plants. 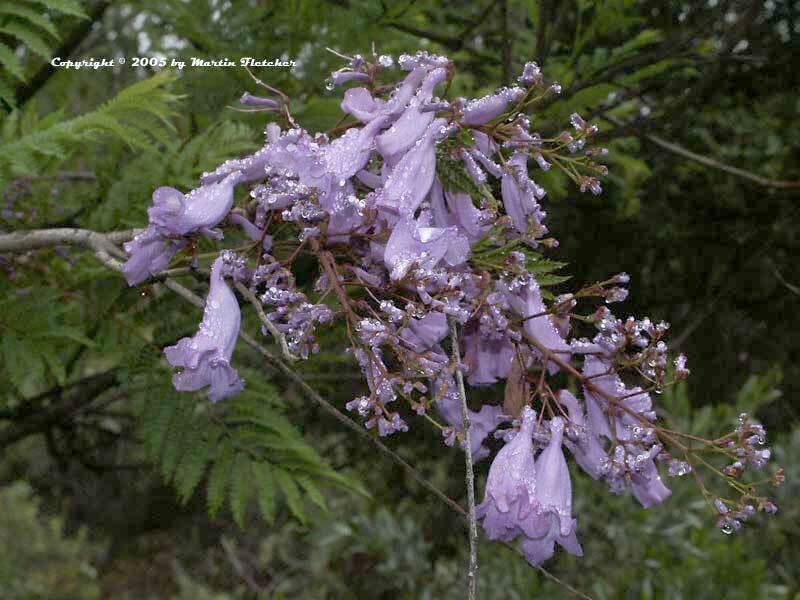 In our area the Jacaranda mimosifolia trees will sometimes have seedlings but it is fairly rare. I have yet to see one in an area that was not planted. Jacaranda mimosifolia is tender in the mid to low 20°s F and can stay deciduous until quite late in the season. There is a white selection Jacaranda mimosifolia alba. It is both more tender and weaker growing. The soft ferny foliage is very attractive while it is on the tree. The lavender blue flowers and leaves can make a tremendous mess as they all litter a driveway. The flowers tend to stick to the paving if they have been stepped on or driven over. The Jacaranda trees tend to put out branches at odd angles and suckers from most any part of the trunk are common so regular pruning is advised. Jacaranda mimosifolia is native to Argentina and Bolivia. Purple flowers and foliage of Jacaranda mimosifolia. High resolution photos are part of our garden image collection.